To call La Bombonera an institution would be a gross understatement. As the third oldest restaurant on the entire island of Puerto Rico, La Bombonera has continuously been one of the most solid breakfast establishments around. They are best known for their mallorcas, which is a popular food item in Puerto Rico brought over from Spain from the island of Majorca. Historically, there is a close tie between the ensaymada bread that I grew up with from Filipino bakeries and the mallorcas of Puerto Rico. Both originate from Majorca and evolved into their own delicacy during Spanish colonialism. This sweet and fluffy egg bread topped with powdered sugar is transformed into one of the greatest breakfast sandwiches when ham, egg, and cheese are added to the mix. At under $5, this is a delicious and inexpensive way to start your day. There are several places in San Juan where you can find some version of the mallorca. However, La Bombonera’s reputation stands true. Sure, this place has been featured in magazines and travel shows left and right; but rightfully so. Unfortunately, those looking to get a taste of this treat may stumble upon a grim reality. As reported in Vocero last week (while we were on vacation in San Juan), there has been a lease dispute between the owners of La Bombonera and the landlord of the building that houses the restaurant’s offices, kitchen, and restrooms. They have announced that they will be closed for an indefinite amount of time starting Monday,April 30, 2012. Whether they will renovate, re-open, or close for good is still up in the air. 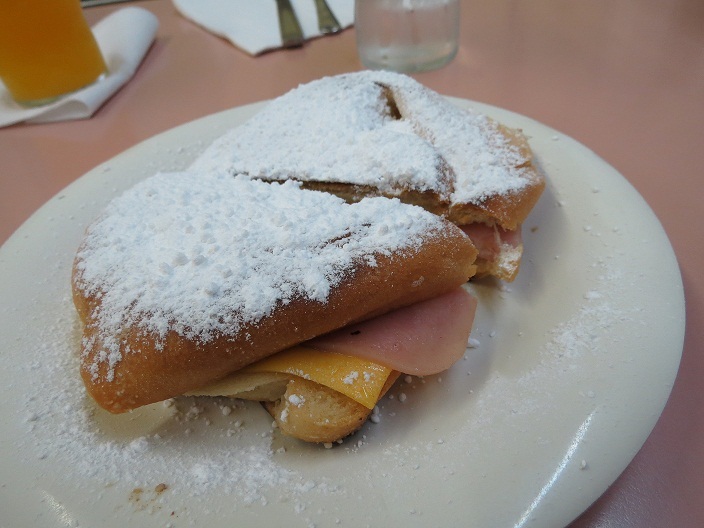 Browsing a couple of travel forums, there is rumor that La Bombonera will re-open as a to-go only bakery. I really hope this is true. La Bombonera opened its doors for the first time nearly 110 years ago. 110! The atmosphere is incredibly laid back and despite being a popular spot for visitors, it’s remains a hub for generations upon generations of locals. If you get the chance to pay them a visit, I highly recommend it. La Bombonera is located at 259 Calle de San Francisco, Old San Juan, PR. THIS PLACE IS THE BEST IN THE WORLD.. BEST MALLORCAS EVER! !